Authored by three world experts, this is a clinically focused book on pediatric anesthesia. 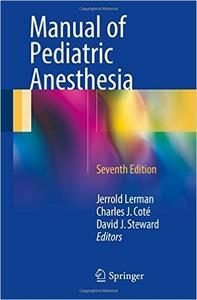 “The Manual”, as it is known, has long dominated the market for a succinct and practical resource on administering anesthesia to children and is used by residents, general anesthesiologists, nurse anesthetists, and pediatric anesthesiologists. This new edition retains the basic structure of the book and is updated throughout. Text-heavy in the current edition, the Seventh Edition features the addition of figures to chapters where they are especially helpful (eg, the chapter on cardiovascular surgery and cardiac procedures) and makes greater use of headings to break up the text and guide reading. From reviews of the Sixth Edition:”This is an extremely well written book that I would recommend highly to anyone involved in anaesthetizing children. It is comprehensive enough to provide an excellent reference for trainees and general anaesthetists who occasionally deal with paediatric cases, while at the same time giving valuable supplemental information for paediatric anaesthetists encountering an unusual procedure or condition. In short, this is a book that would make a welcome addition to any anaesthetist’s mobile library.” –Anaesthesia.